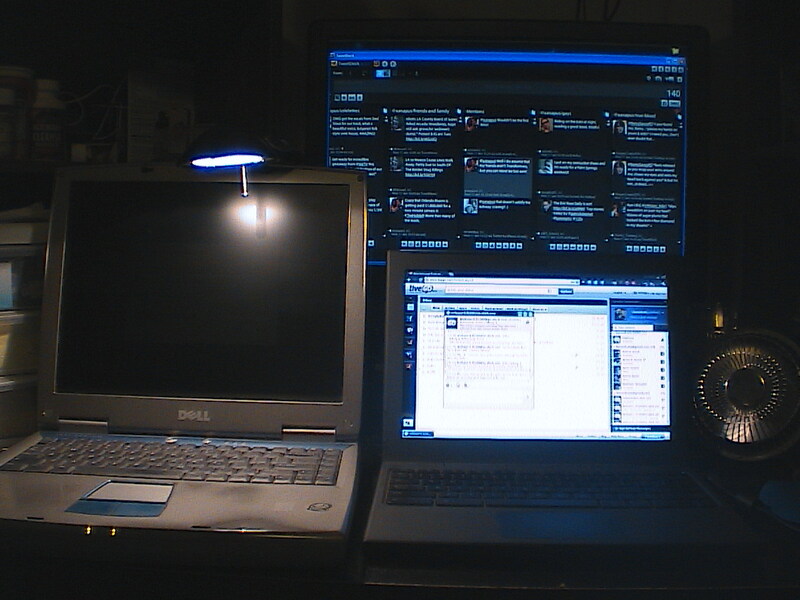 Yesterday I decided that I wanted to bring out my old Dell Inspiron 1100 laptop and see if I can get it working. The computer works, it’s just that the screen doesn’t. When you turn it on the screen lights up and you can see everything but then it dims out and you can see shadows of what is on the screen but only if you have a bright light on it. I had to use my desk light so I could see the screen. Normally I sit here with the CR-48 (the smaller laptop) and the desktop going so it was a bit strange having this bigger laptop on my desk taking up so much room. What’s the point of bringing it out if it doesn’t work you ask? Well, I was trying to see if I could hook it up to my TV. I have a Panasonic HDTV that I can plug a PC into. The laptop has a monitor plug as well. In fact when Chips computer wasn’t working and he needed a computer, he was using the laptop until the screen decided to go black then we hooked his monitor up to it so he could still use it. Well, it works great on monitors but not so great with my HDTV. In fact my TV didn’t recognize it at all. I think maybe because it’s an old laptop from 2004. My point for wanting to hook it up to the TV was so I could use that as my internet tv box. I could have it hooked up to the tv and watch Hulu and Netflix with it. If it was slow (which it is) then I would reformat it so I could have a faster laptop for this purpose. Unfortunately since it doesn’t connect with my TV then there’s no real use for it so I may as well toss it back in its laptop case in the closet. I would like to buy a new screen for it and while I’m at it upgrade the hard drive and give it more memory. If I couldn’t use it as my internet tv for my HDTV, then at least Darrin would have a computer to bring with him to work but that’s gonna cost a lot of money that neither of us have. He has a desktop at his job but I figured he could use a laptop as well for when he’s out and about. The whole exercise wasn’t a complete waste of time though, at least I learned that it does not work on the tv and I got to give it some windows updates. One of the windows updates was for the video driver which apparently did no good since the screen is still black. I paid $700 for this laptop in 2004 and today since the screen doesn’t work the laptop is probably worthless. Then again what else is new lol.